By supporting my Patreon, you support all of these projects and more. You are also uniquely qualified to provide feedback and direction on them, and tell me where I should be investing most of my time. That's what you really buy: time. I can't possibly give all of these the attention they deserve while busy making a living on proprietary software. With your contribution, that dynamic can change. 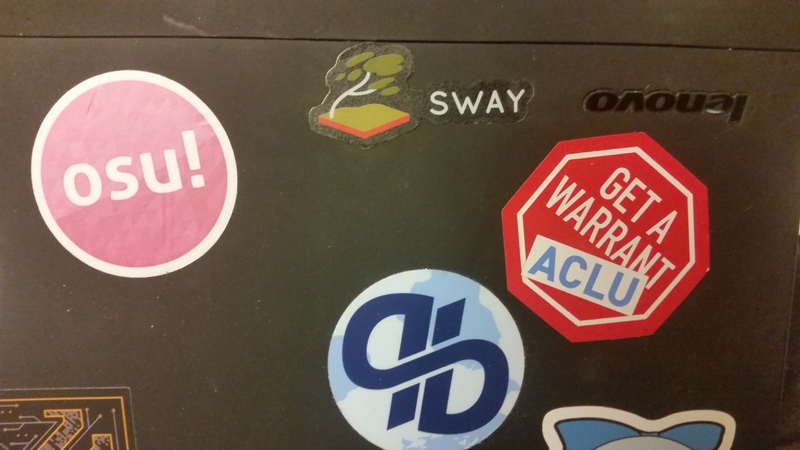 I'm also offering some more tangible rewards, like Sway stickers and early access to my new software development platform, sr.ht. I'd love to hear your ideas for more rewards! Perhaps shirts? Stickers for other projects? Let me know! Note: rewards that permit you to put markdown on the backer page are limited to using bold or italic text, or links. If you have other ideas, feel free to ask. I'll try to accomodate them within reason. I also reserve the right to veto blog post ideas (I'm not going to post an ad for your company - ideas have to be on-topic for my blog). It takes a lot of work to fulfill Patreon rewards, so I only do it every couple of months. You may have to wait a little while to see your rewards. If you want them sooner, feel free to shoot me an email. Everything coredump gets, but you get 512 bytes of arbitrary markdown to put on the backer page. I will also write one blog post per month on the subject of your choice. See aggregate goal progress here.